Bali villas with private pool, Modern contemporary design combined with open air living, relaxing in open-air gazebo by the pool or set it up with mosquito net to enjoy the evening breeze by the pool. 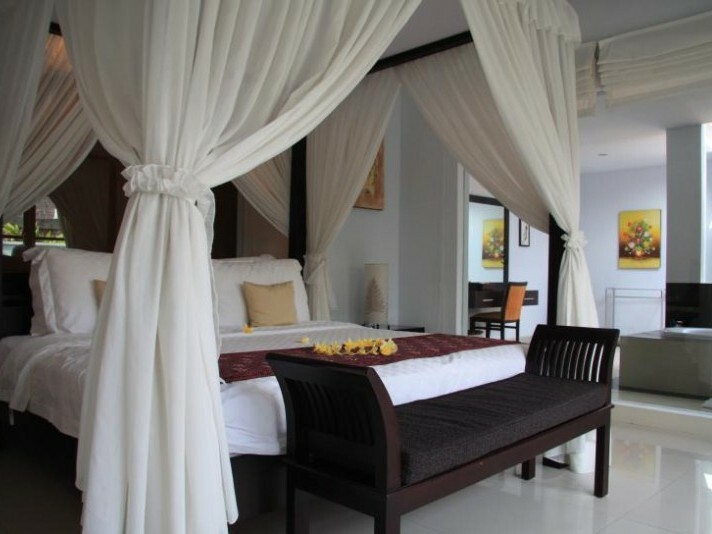 The Bidadari Luxury Villas & Spa comprises of 19 villas, 7 one bed room villas, 11 two bed room villas and 1 three bed room villas. with private pool, secure parking at the front of the lobby and friendly staff. situated in Umalas, an area of lush rice fields and shady coconut groves on the southwest coast of Bali. The access to the guest villa is easy and nice to walk with Bali tropical gardens on sides, however, the buggy car is also available. The villa is perfect for Your honeymoon in bali, our impeccable personalize service assures that your honeymoon at The Bidadari Luxury Villas & Spa shall be memorable. The facilities section of this site has more information about the villa facilities like the private pool, garden and kitchen.